I’ve been a long term advocate of the use of infographics in education and especially enjoy thinking of ways that students can be encouraged to engage with and question the content as well as create their own graphics, so when I rediscovered Visme.co I was really delighted to find the tool that I once thought was a PowerPoint substitute for creating online presentations had turned into an awesome interactive infographic creator. What’s so impressive about Visme? 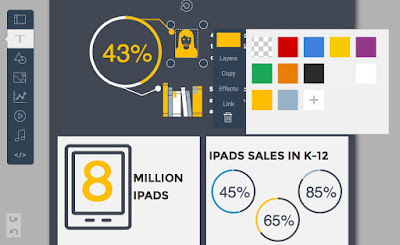 I’ve used quite a few infographic creation tools and most are either template based or they have a library of assets which you can drag and drop to construct your own layouts. 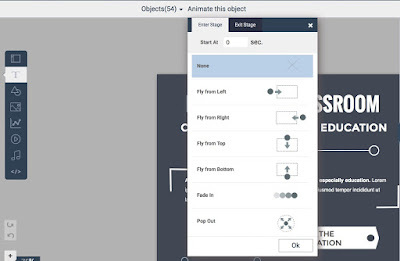 Visme.co offers a combination of both these options along with the possibility to animate the elements within the graphic, drop in your own images or online videos and also embed html elements such as polls and quizzes into the graphic. 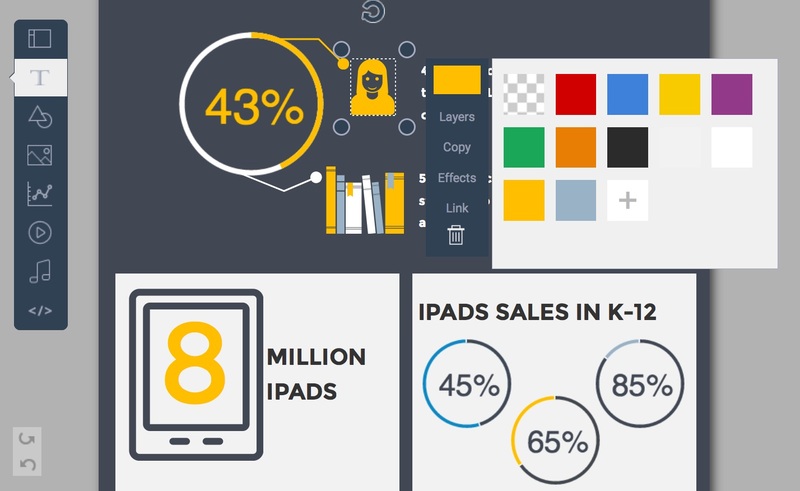 This enables your infographic to be more than just data display, they can act as multimedia tools to encourage user responses and build learning and research and it's built on html 5 so it works across mobile platforms too. When you go to the Visme.co dashboard you get three main options. 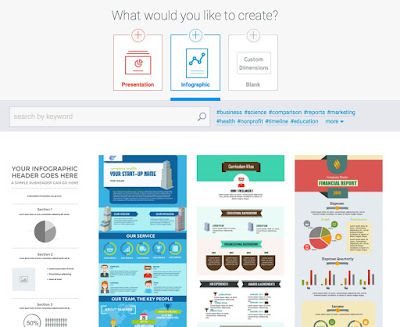 You can create a presentation, an infographic or use a blank space to create any kind of hybrid of the two. 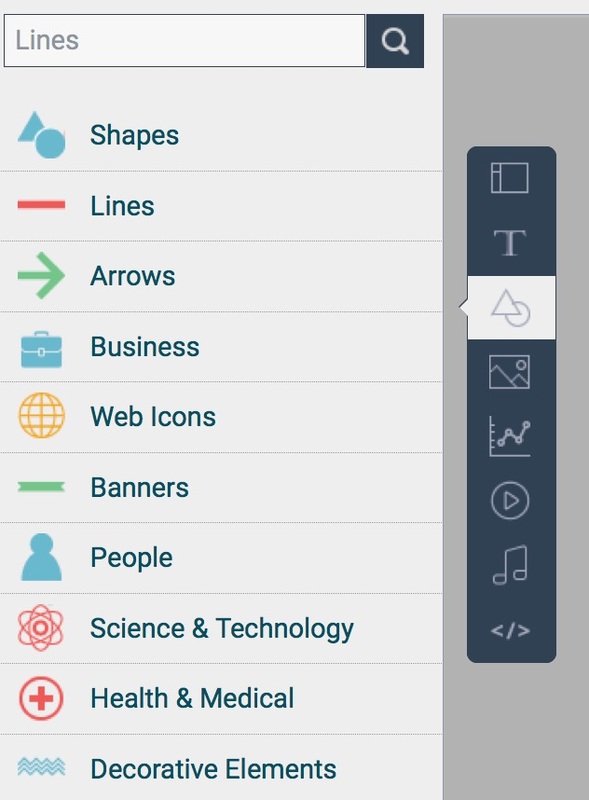 If you choose presentation you get a number attractive templates which you can flick through and select. Once you have selected one you can edit the design and images and add your own content. If you choose infographic you can search through a wide range of completed infographic designs and choose one with a structure similar to what you want to display and edit and customise it for you own data. Every element within the graphic can be edited, moved around and animated. If you choose a blank canvas, then you can search through the images and icons library and create your own design from scratch. You can choose the size of your canvas so that it can be presentation size or more of a poster format. You simply drag on any elements that you want to include from the graphics library and then click on then to edit them to suit your design. It’s easy to resize them, change the colour or even animate them. You can also search through and add images. You can find some really nice examples of what’s possible on the Visme blog. Visme.co is a really flexible tool which offers the choice between using templates to develop your content and an open canvas. There is a huge range of professionally designed icons and graphics you can simply drag and drop into your creations to make them look professional. 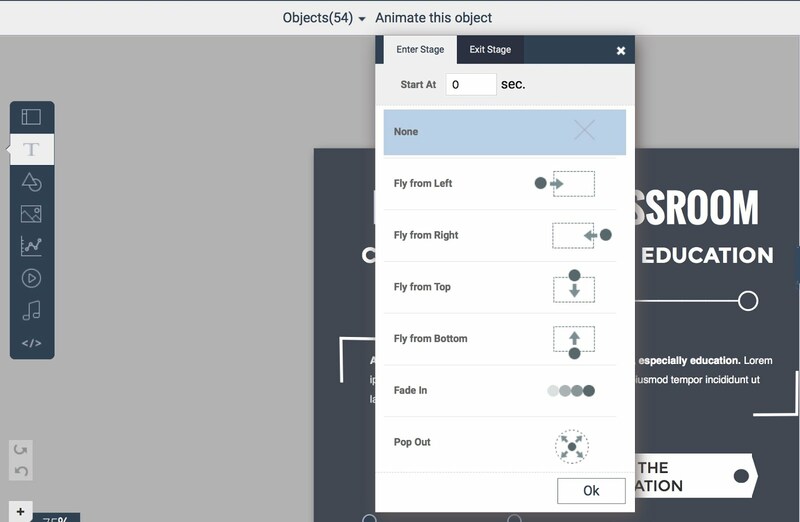 The potentials for dropping in html objects such as quizzes that enable interaction can make static data much more dynamic. The ability to drop in multimedia and particularly video can lend more significance and impact to the information in the graphic. You can hyperlink elements within the page to pages on the internet so you can use this to show sources of information or link to other images or background information. Visme.co is built on html 5 so runs across platforms and devices. Create multimedia posters - You can get students to research a famous person and create a poster about them. This could be a fan poster about someone they like, a historical character or even someone in the news. They can add short video clips about the person as well as a range of facts. Combine lectures with visual notes - You can combine a short lecture video with some notes about the lecture to teach students visual note taking skills or to make the content of the video more meaningful and memorable. Create interactive animated work sheets - You can create colourful worksheets with images or text that links to various resources around the internet and embed them into online courses or blog posts. Poems or songs with visuals - You can have videos or audios of songs dropped into graphics and add images and icons that help students to understand the words. This is an example of a poem reading with a visual gap fill activity. The images below illustrate the words of the poem, but there are some clouds with question marks and students have to listen and hear the missing word. The cloud is also hyperlinked to the answer (an image of coral), so they can check their answers. They can then use the images to help them remember the words of the poem. 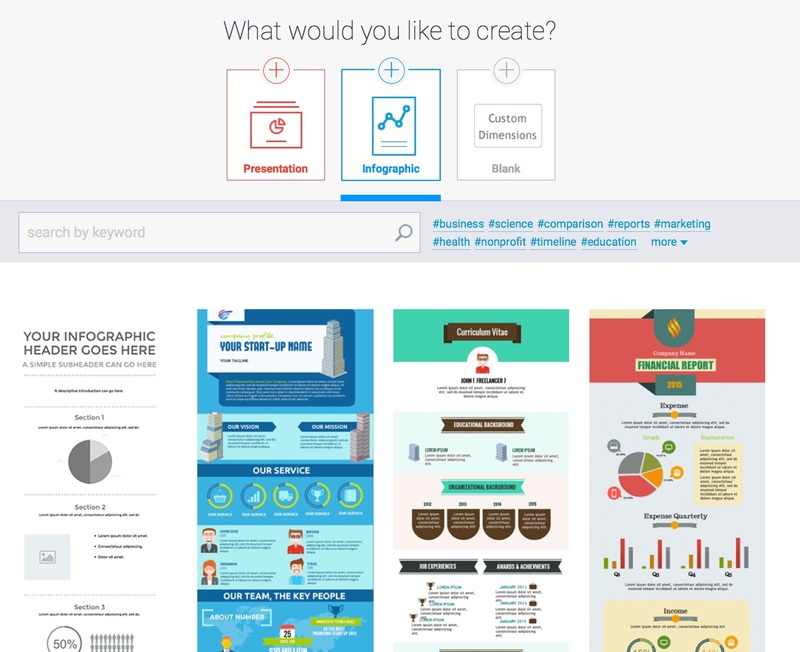 Publish student research - You can ask your students to do research and find data and information about various topics and then create their own infographic display of the information. Transforming text to visual - You can get your students to create a visual representation of a text as a means of checking comprehension. This could be based around literature, such as a play or story they are reading or it could be a representation of the information in an article or essay. 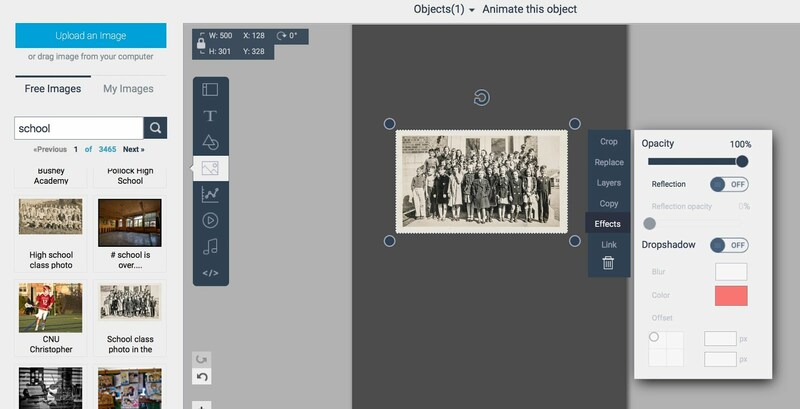 Tools like Visme.co are great to lift the level of engagement in your classroom whether you use them to create tasks, present information or put them in the hands of your students to do the creating. There is a learning curve with these tools, but Visme.co provides some great tutorials and support to get you and your students started. Visme.co is a commercial product with premium lisences but there is also a free lisence you can use with your students. I hope you enjoy using this amazing tool.